As part of a distinguished military career, Stuart William Hughes Rawlins (1880-1927), known as ‘Tots’ (his wife was ‘Dots’), served in both the Second Boer War (1899-1902) and the First World War. 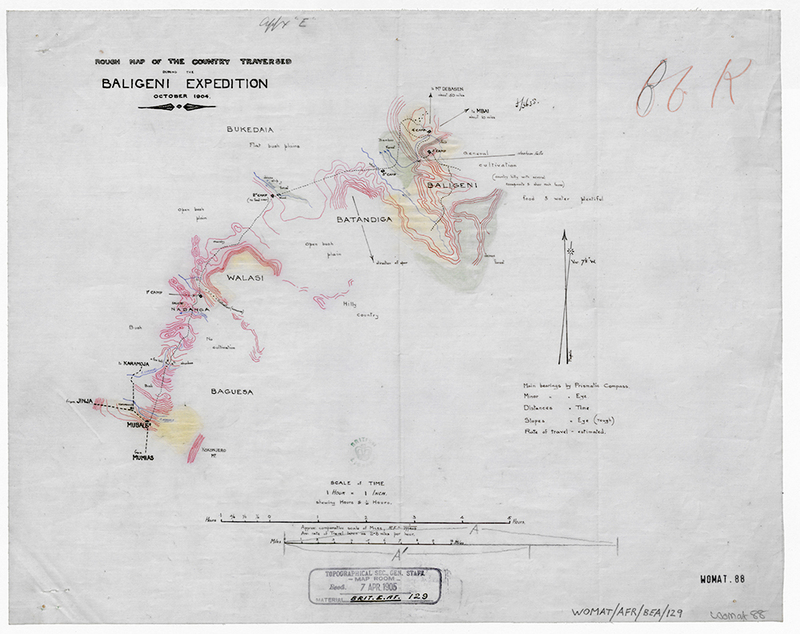 At the time of this map’s production he was attached to the newly founded King’s African Rifles (KAR) as part of the 5th (Uganda) Battalion. The KAR was a colonial regiment raised from possessions in British East Africa, which acted in both military and internal security capacities until independence in the 1960s. Notable other servicemen of the KAR include Idi Amin and Roald Dahl, albeit at a much later date than Rawlins. 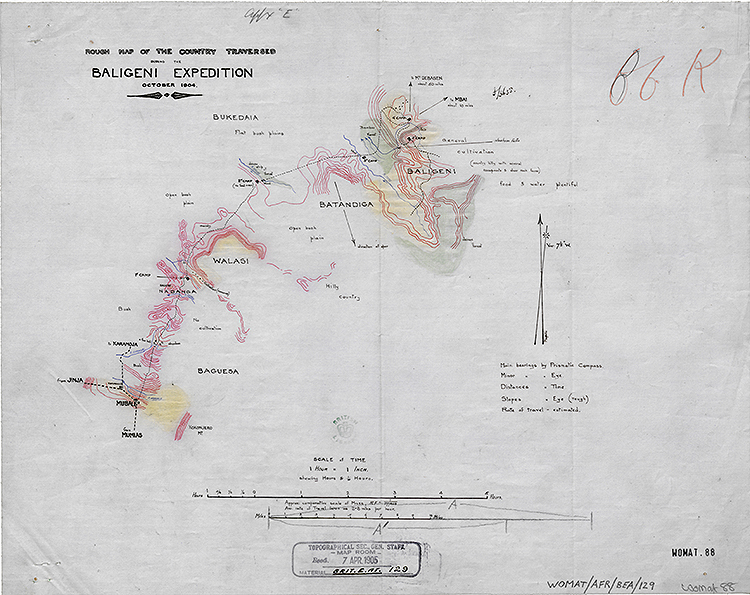 During his service, Rawlins produced many surveys of the eastern region of the Uganda Protectorate, including this record of the route taken by an expedition against the Baligeni tribe in retribution for the recent murder of traders, during which, on 23 October, Rawlins came to close quarters with tribesmen while coming to the aid of a police party. This map shows settlements – at the bottom-left is Mbale (‘Mubale’) – and tribal regions, including that of the Batandiga, who are said to have the power to control the rain. Vegetation, cultivation, food and water are also noted and distances are recorded to a scale of time: ‘1 Hour = 1 Inch’.